Boiler Not Igniting? Here’s 6 Reasons Why, And What To Do Next. Welcome to our 3-minute guide to diagnosing faults that cause a boiler not to ignite. If you’re having trouble with your boiler not firing up for central heating or hot water, this guide will help uncover some potential issues, and what you should do next. But first. Working on a gas appliance should only be done by a qualified engineer. If you’re looking for a repair or are considering a new boiler, you can get quotes here. Or, if you’ve been contemplating a new boiler with a long warranty, we’d recommend BOXT. Being part owned by Bosch, they’re able to offer Worcester boiler installations much cheaper than most installers. While you’re reading, you can get a fixed price online (no personal details needed) using their boiler calculator (prices start from as low as £1,795). The gas valve controls the flow of gas to your boiler. When more heat is needed, the valve opens to provide more fuel (and vice-versa when water gets up to temperature). A gas engineer can check for all the above. But, if your boiler isn’t igniting due to a gas valve issue, there’s a good chance the reason stems from incorrect adjustment. When a boiler’s gas valve is incorrectly adjusted, it will lock out when supplied with too much gas (because it’s dangerous), or too little gas (because the boiler’s PCB recognises a gas supply issue). Like combustion engines on cars, a boiler produces carbon when it burns gas. This gas can get clogged up in the burner, and will eventually mean that it runs inconsistently, or refuses for fire up for hot water and heating altogether. Unless the burner is damaged, cleaning out any carbon build-up will fix the issue. If the burner is in a bad state, it might be worth considering a replacement. Testing pressures here will determine if there’s a problem with the gas supply, and where that problem lies. Like gas valve faults that give too much or too little gas, a boiler will lock out and display a fault code if the gas pressure isn’t correct. On a side note, if your boiler only refuses to ignite during cold weather, there’s a good chance it’s the gas meter that’s the problem. Gas meters have a regulator fitted to them. And, in low temperatures they can freeze. The solution here is to lag the gas meter and regulator, to protect it from wintry conditions. The electrode and ignition lead could be the issue if your boiler doesn’t ignite, and you hear clicking/ticking noises. Gas related issues will create intermittent operation (i.e. the boiler ignites, and then goes straight off). However, without a functioning ignition lead and electrode, the boiler won’t ignite at all. A gas engineer will be able to test the electrode and ignition lead using a multi meter. If the fault lies with either of these parts, it’s much cheaper to replace them rather than to recondition them. When demanding hot water or heating, the first thing to operate will (or should be) the fan. The fan in a boiler doesn’t cool down the boiler, it helps to create a draught. 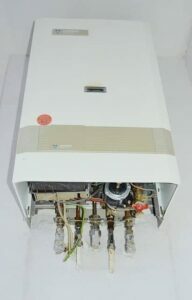 This draught pushes harmful gases from the boiler, into the flue. These gases are then taken out of your property. If the PCB (the boiler’s circuit board) doesn’t recognise the fan is operational, it won’t ignite, and will lock out instead. This lock out procedure is put into place because it would be dangerous for the boiler to ignite. If your boiler isn’t igniting and you can’t hear the fan, this could be the issue. Fans are expensive so where possible, it’s worth reconditioning them (such as fitting a new motor), rather than replacing the whole unit. If the pilot light on your boiler has gone out, the cause is usually debris blocking the jet. The jet for the pilot light is tiny. Even a small spec of dirt can block it, cause the pilot light to go out, and then the boiler won’t re-ignite. These jets are cheap to replace, but they can usually be removed, cleaned and reinstalled to fix the problem. What Else Can Cause A Boiler Ignition Failure? There are 100s of things that can cause a boiler ignition failure. Your boiler has various fail safes integrated into it (such as an air pressure switch). Whenever the boiler sees a signal that’s unusual, it will lockout. We’ve created a boiler fault finding guide here, including guides relating to specific brands, boilers, and boiler parts. If you want a generic overview of potential faults before investigating individual parts, we’ve created a guide to the most common heating and boiler problems here. If you’re having problems with your boiler not igniting, always consult an expert. You can get in touch with Gas Safe engineers to fix your old boiler, or simply replace your boiler with a brand new Worcester Bosch from £1,795 here.